Following the judging of the AR Housing Awards, Architecture Review spoke to Cany Ash about the practice's approach to housing projects and giving residents a sense of agency. It’s possible in architecture to create some openness in the interface between people's private spaces and shared circulation or all the streetscape and I think that that is achieved partly through being having a less precious and rigorous geometry so leaving some open-ended cues or by deliberately planting small moves which which beg a question - a piece of architecture which is provoking a question about the boundary of your space to your neighbour. So for instance, in a recent project that we've been doing in Newcastle the front gardens have a bench, which is a shared bench with your neighbor it's quite a long bench and is a wider than a kitchen worktop. Space that you might either sit on, you could sit cross-legged on, you could also pile up with plants so it's like you make your own boundary between those faces. And I think that that's also possible to do within a block of apartments or if there's an opportunity to take the lift and over-run up to the roof so that you can open up that space for inhabitation. That's obviously a great space for people to share and that, together with management, you can you can offer future residents a kind of agency to change their spaces. What's quite exciting about it is that the residents have all become really good friends and meet socially once a week, you know in a big group. Twenty to thirty of them just enjoy showing the fact that they're sharing the projects and these a lot of the quirks of the project become the things that get talked about. 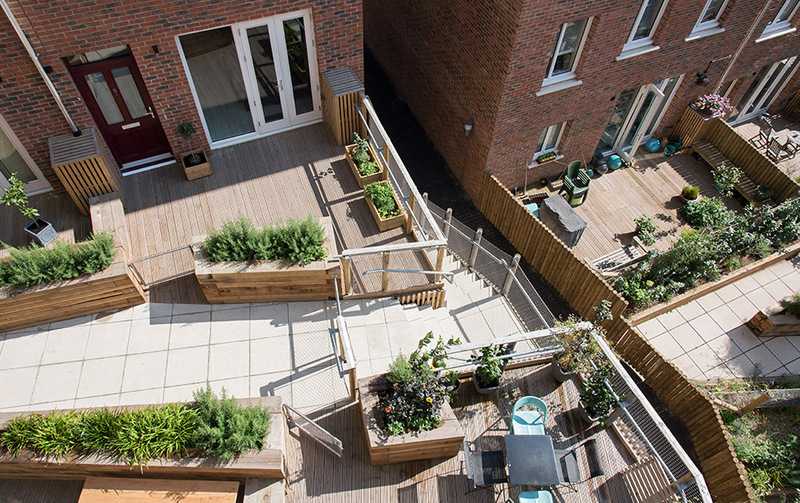 And how people have taken on their front patios or their terraces or their roof terraces or gardens because there's such a lot of diversity in the form of each living space and its relationship to outdoor space. There is always a puzzle to it and and an intrigue and the comparing and contrasting is is part of the fun. Any ambiguities or questions that one can plant into a project allow for better city-making and neighborhood-building. So the agency is almost in the fuzziness for your logic in the architecture. Mixed-use, as it's known, is just a very logical way of using space on the ground plane. so that you can bed in business and social enterprise and shared activities. The ground plane is a kind of privileged cone of vision as you're walking along a street so that kind of animation and transformative possibility that comes from large areas of glazing, from a kind of decoration if you like of those spaces can bring a lot more richness into a living zone, into a residential area. In East London, we built some flats for Peabody which were for low-cost home ownership. Where the staircase was, it became a multi-levelled garden, where the residents could gather at first floor level to have breakfast together. It was just a sunny place and I think it's finding those moments where you can make the generosity to bare circulation that allows those things to happen and also allows people to create spaces which they know are their own. So we had front gates to those spaces, those terraces, but you could then invite people into that space, which happened there. There is a certain internal grammar and vocabulary is developed about how things want to come together and in a way that that is part of the excitement of making architecture but you need to feel it's authentic and you need to feel that it has a certain consistency and drumbeat and meaning throughout the project. So for instance, in Southwold, where we are building a mix of affordable social and private housing, we were picking up on flintwork for front garden walls and black-tarred surfaces and certain steep pitches of tiled roofs and things which fitted with the plan form and the particular background site that the project was set in. And other times, as with the Peabody project I mentioned before, we were playing with the idea of packaging and how a new part of London could find its feet as a fast and ecological construction through using layering, which is you know very often covered up with brickwork. So you need have your timber framing, all your membranes and then you cover it with brick. We were looking to see if one could see through and enjoy the craft of how contemporary architecture has been made, seeing through various materials, picking up on the reflectivity of membranes and recycled wires to create a kind of kinetic architecture that we felt reflected what was going on. And in that area of Silvertown, I suppose you know that the craft of certain things have developed, such as screws jumping on to pozi-drive screwdrivers, which is really exciting and has changed the way that construction happens. so a lot of construction that's on site now actually has a lot of that kind of prefabrication. Even when it's not prefabricated, it has a certain immediacy and intelligence. People always talk about old craft being clever but I think there's a lots happening now with staple guns and membranes and pozi-drive screwdrivers which is the new way of doing things. It has an internal logic so at the moment we are looking at some very dense apartment blocks in East London, in Hackney Wick, and we are looking for ways to celebrate communal entrances and make a very definite statement, which you wouldn't have at say a cycle storage doorway or bin store and so embedding in terazzo doormats, quite deep doormats with lighting to create these jewel-like entrances. In some places, the cladding takes the cladding from further up the building, this kind of gold anodized corrugated… It's almost the new vernacular for covering up complexity. When you go beyond the brickwork. The lighting brings those different crafts together, in a machine-driven sheet format. And a free-flowing cementitious mix which then is ground off so there's something of your old joinery coming in, with the aluminium, and something of very special inset encaustic-tiled doormat, coming in from Victorian times but just done in a different way.